Bobs Cove was actually our favorite spot in all of Queenstown. 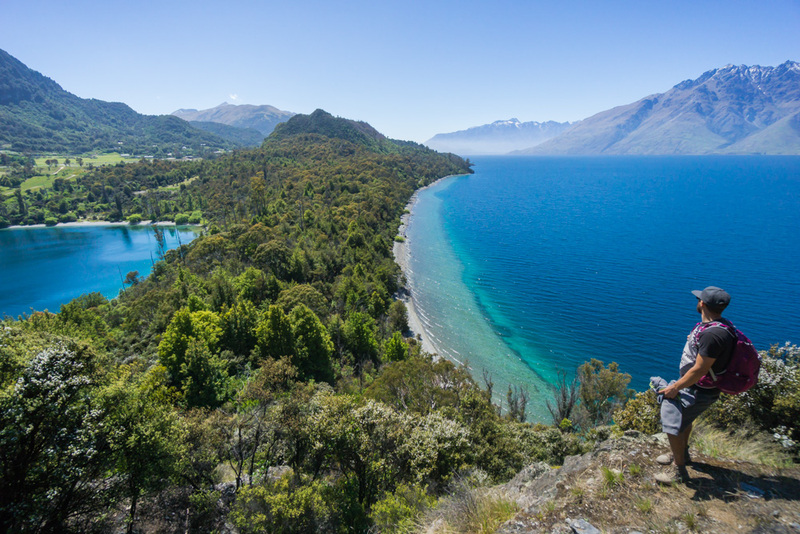 This secluded area offered escape from the summer tourist crowds, and the pleasant nature walk to the pier and a picturesque lookout make for the perfect short excursion, especially for those heading towards Glenorchy from Queenstown. The cove also has such crystal clear turquoise water great for photos and swimming. About 17 minutes away from Queenstown on the road to Glenorchy, the dirt parking lot for Bob's Cove is a sharp turn off the main road after passing Wilson Bay and the Twelve Mile Delta (Lord of the Rings filming site for Ithilien Camp in Gondor!). This hike seemed slightly hidden, as there weren't many cars in the mid-sized lot when we visited. From the lot, the trail starts descending down through the forest heading towards the water's edge. The flora here had such tropical vibes with all of the moss and tall trees. Just 0.1 miles in, we spotted the edge of the turquoise water through the trees. As we approached, I couldn't believe this was a fresh water lake, the water seriously looked like a scene from a tropical ocean bay. We hung out on the sandy/rocky beach for a little admiring the views. 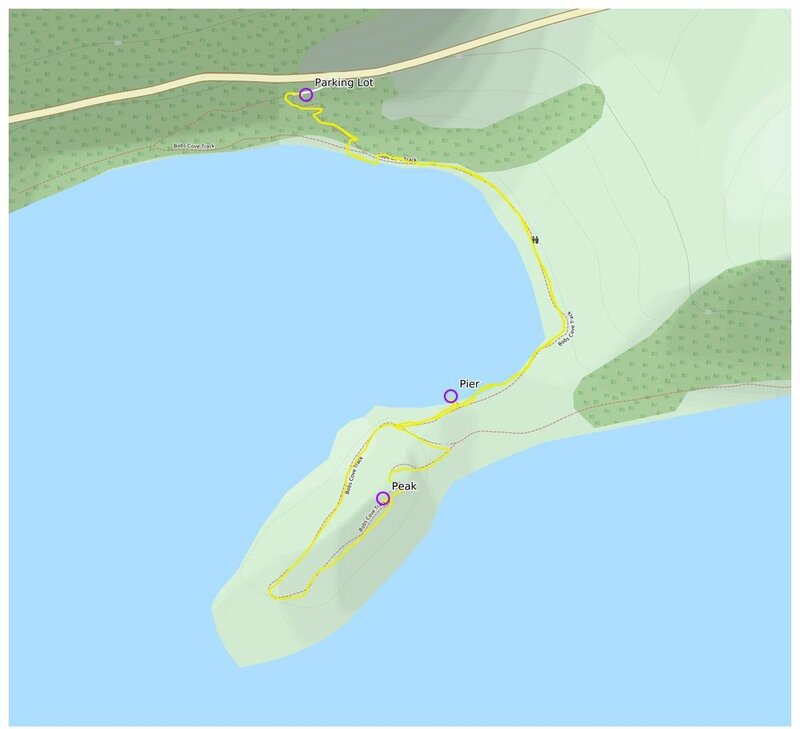 From this spot, we spotted the pier on the opposite of the cove, as well as the hill on the peninsula jutting out into the water, so we decided to get back on the trail to continue around the cove. Along the way we passed several great beach spots, as well as the remains of a historic lime kiln from the 1800s that used to process the nearby limestone. 0.7 miles in we reached the pier that jutted out over the crystal water. Sitting out here above the sparkling water was definitely one of my favorite views of the hike, and you could see each rock on the bottom of the lake. Continuing down the path alongside the water, we reached the very tip of the peninsula where the trail turned back and started climbing steeply toward the peak. 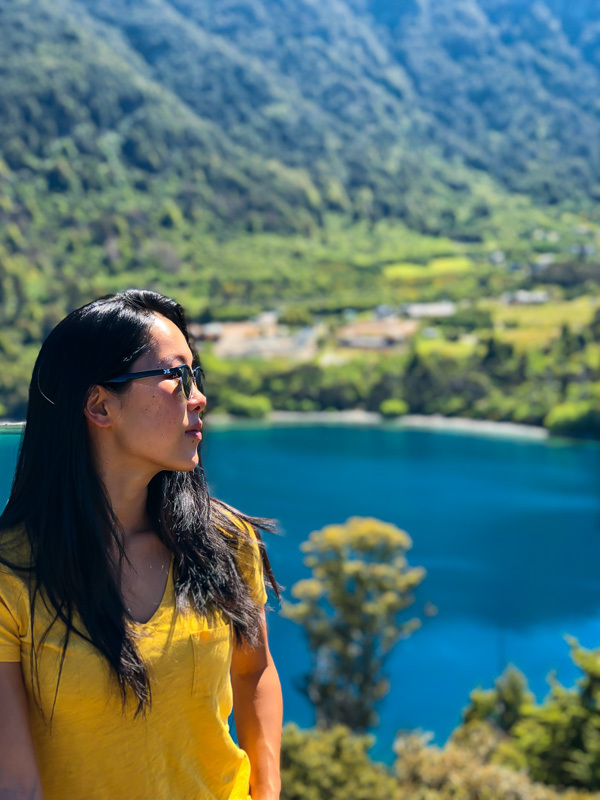 We gained about 170 feet in elevation to get to the peak, which had a great lookout of the narrow neck of the peninsula that separated Bob's Cove from the rest of Lake Wakatipu, New Zealand's longest lake. At the top of the lookout there was a nice bench to hang out at. From this spot, we could even spot the snow-covered Remarkables in the distance. When we were ready, we continued along the path which headed down the other side of the cliff. The view of the narrow neck of land was the best from this cliff. As we descended, we rejoined with the original trail 0.2 miles from the peak. As we retraced our steps back to the car, we found a nice sandy beach along the cove and decided to go for a nice swim to cool off. For us this short walk was the perfect way to start our day trip to Glenorchy. Bob's Cove pleasantly surprised us with its remote feel and gorgeous water. We could have easily spent a good amount of the day lounging around at this cove, and I can see this spot being pretty popular in the summer months when the water is warmer.